If The Land Down Under wasn’t on your bucket list already, this might just change your mind. Australia is an extremely photogenic country, loaded with incredible sights, natural phenomenons and world-famous cities. So when you’re out looking for the next amazing photograph, it can almost be overwhelming. In order to help guide you, we’ve compiled a list using Tourism Australia’s most liked Instagram photos. Here are 11 of the most Instagram-worthy places in the country that will make your feed pop and leave your followers awestruck. Just a 25 minute ferry ride away from Townsville, Magnetic Island sits in the Great Barrier Reef Marine Park, but offers an environment much more rugged than the typical islands in the area. It gets less rainfall and its extraordinary landscape of rocky terrain is covered in eucalypt woodlands. Multiple shipwrecks are scattered around the island as well that will put your underwater photography skills to the test. 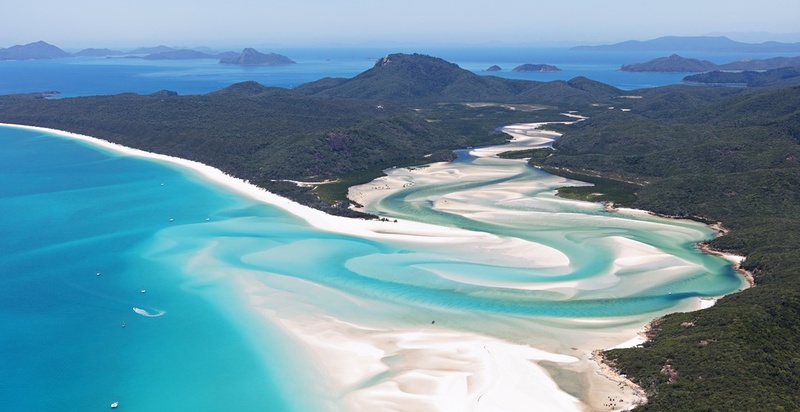 If you want jaws to drop while people are scrolling through your feed then you have to check out The Whitsundays. Made up of a series of 74 islands, the majority of which are uninhabited, this tropical paradise offers crystal blue waters and silica sand beaches. The islands also boast the second best beach in the world, according to FlightNetwork. No, your eyes are not deceiving you and no, this is not a filter. Lake MacDonnell is truly vibrant pink and is one of Southern Australia’s wonders. It’s the lake’s high salinity levels, combined with the presence of salt-loving algae and pink bacteria, known as halobacteria, that gives it its colour – basically a natural strawberry milkshake. Boasting freshwater lakes, coloured sand cliffs, woodlands, sand dunes, and sheltered mangroves, Fraser Island is a photographers dream. According to fraserisland.net, it is the world’s largest sand island and the only place where tall rainforests grow on sand, making it an extremely unique geographical location. Beaches like the one above, a multitude of wildlife, and located just two hours from Sydney. Need we say more? You cannot have a list like this without including one of the most iconic harbours in the world. Sydney Harbour, featuring the famed Opera House, has plenty of photo-worthy views that can offer something different depending on the time of day. I’m sure we don’t need to tell you, but this is a can’t-miss stop. Does nature get any more perfect than this? In order to get to Wineglass Bay, one has to hope the pond over to Tasmania, but once you arrive there is no shortage of stunning shots to add to your ‘gram. Located in the Freycinet National Park, you’ll find this beautiful bay that is towered over by pink granite peaks. It’s best viewed by hiking Mt Amos or from above on a scenic flight. Here is a game to play with your friends: show them the above photo and ask if it is ‘Earth or Pandora?’ Tathra is fittingly located on the Sapphire Coast between Sydney and Melbourne. By day, the ocean algae in the area appears red, but by night it turns a fluorescent blue and green. Referred to as bioluminescence, the algae needs to be “agitated” in order for it to glow, like during a rainstorm. If you manage to hit Tathra at the right time…magic. Contrary to popular belief, this is not a centre for ant-sized people. As the name suggests, these boulders in Western Australia look like a herd of elephants playing in the bay. With some clambering around, you can find a collective of vantage points for some unbelievable photos. Ever shaken a paw with a kangaroo? At Lucky Bay it isn’t out of the question. Considered one of the world’s top beaches, Lucky Bay not only offers stunning natural beauty, but is popular for its sunbathing kangaroos. Just a 40 minute drive from Esperance in Western Australia, this a great spot to photograph ‘roos’ in the wild. There is a chance you might even make a couple new friends in the process. Want to share your favourite spots in Australia right here on Mapped? Email us at [email protected].